Ya Jagoff!!! | Parking in Omaha Nebraska...Yikes! Home Parking Jagoffs Parking in Omaha Nebraska…Yikes! Nonconformity can be good for some. But not when you’re in the middle of a parking lot because this @#$% is gonna mess everything up once everyone starts to leave in a rush. In Omaha, NE at a AAA baseball game (Storm Chasers are an affiliate of the KC Royals) and I see this in an open field parking lot. Seriously, two in one. While we do not recommend damaging anyone’s vehicle, pretending you’re a driver in a back-hoe at a junkyard smacking these cars around is almost as invigorating as talking about how much of a Jagoff Tom Brady is…. ALMOST! Just by looking at this, we can tell that these two drivers are gonna be those drivers who ALSO don’t know the exiting protocols of getting merging like a zipper. Nope.. they will probably just drive around blocking everyone else at odd angles once the game is over. Dudes…or dudettes… are you the same people that have to have a front row at the airport baggage claim carousel .. just standing there blocking everyone else’s access until YOUR bag comes around vs standing back 3 feet and stepping up once your bag actually comes around, YaJagoffs?? Special thanks to Dave M from Nebraska for being today’s Honorary Jagoff Catcher! Previous article#YaJagoff Podcast / Oy Vey! Jagoffs and Oysters in Lawrenceville! Car Hokey Pokey With The Neighbor! A Bike Parking Jagoff! 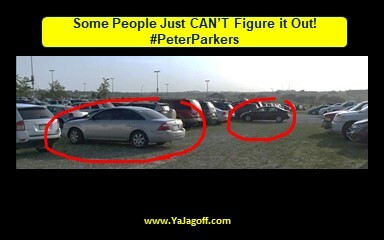 #PeterParkers Get Better and Better!!! A Cleveland “Peter Parker” Turned In By A Cleveland-er!